Peppermint Crisp is a milk chocolate bar filled with a multitude of thin cylinders of mint-flavoured toffee. Invented in South Africa by Wilson-Rowntree, it is now produced by Nestlé. 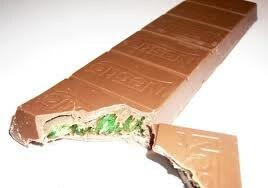 The Peppermint Crisp is sold within Australia and South Africa as a 35 gram bar.